As part of the judging panel, Ruth had the difficult of task of identifying the top three speakers in the Region. A large audience (made up of parents, teaching professionals, family members and friends) listened to 15 different speeches which reflect the priorities, humour and concerns of young people. The “Speak Out” Challenge! offers all state schools in London and Essex the opportunity to train Year 10 students in the art of public speaking. Through a knock out process the ‘best’ of these speakers are identified and go on to an inter-school competition to vie for the title of Regional Champion. The “Speak Out” Challenge! Is the largest youth speaking event in the world. Please take a look at our You Tube channel. Through this programme, we train over 18,000 teenagers (14-15 year-olds) every year in over 550 state school in London and Essex. At the end of each training workshop we hold a speaking competition and the winners go through to one of 37 Regional Finals where they compete against all the schools in the borough. 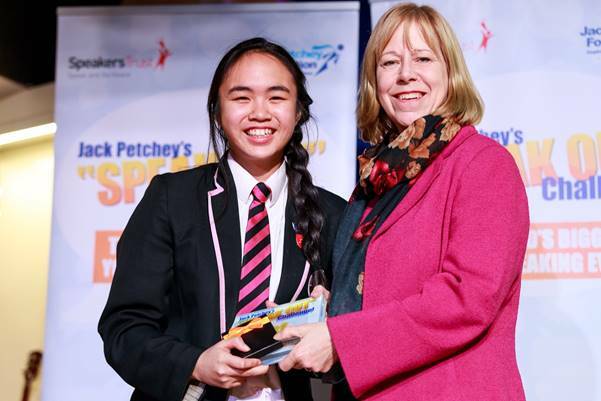 This will be the tenth year that the Jack Petchey Foundation has funded the “Speak Out” Challenge! - a project delivered in partnership with Speakers Trust. The event took place on Tuesday 6th March at this year’s host school The Heathland School, Hounslow.